Matsushiro Samurai School (松代藩文武学校) was built in 1853 by Sanada Yukinori. It is the only remaining Samurai School which has complete sets of all kinds of training facilities. Samurai of Matsushiro used to study not only all martial arts, Jujutsu, Kenjutsu, Archery, Spear, but also study literature, artillery and tactics. Addmission: 200 yen for adult, 80 for kids. Matsushiro Samurai School is built in 1853 by Sanada Yukinori. 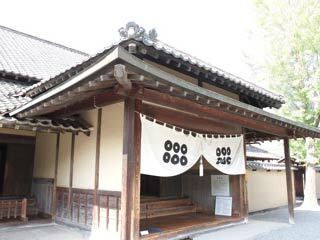 When Sanada Nobuyuki, the brother of Yukimura, moved here as a feudal load of Matsushiro, he encouraged the education of Samurai. He designed Samurai school for both literary and military. His encouragement of Samurai Education kept going 250 years until the end of Edo Period. Samurai studied the literary, western science, artillery and all kinds of martial arts. This Samurai school is the only school which remains everything in original structures. Those dojo, the training facilities are still used for current Budo School.